If Smart Gilas struggles in shooting the basketball from the outside, you'll know right then and there that they will lose a game against a quality and taller team like Iran and recently to Qatar. With Smart Gilas shorter height, they have no other choice but to rely on their outside shooting. It's make or break for them. If they won't nail those shots they will be in a deep trouble just like what happened in yesterday's bronze medal game against Qatar. Out of several three point attempts Gilas only converted 3 out of 24 three-point shots and the last three came only in the last 10 seconds of the ball game courtesy of Jayvee Casio. Jayvee has been the biggest hero of Smart Gilas but yesterday he struggled and the obvious result was a lost. The final score of that game was 71 to 64 in favor of Qatar. This win of Qatar allowed them to get their 4th bronze medal finish in the FIBA Asia Champions Cup 2011. Gilas on the other hand has just made their first appearance in the semi-finals of the said league. They showed some great heart and resiliency in this game. Though Gilas is relatively smaller than Qatar, they still made the game interesting with their hustle plays. Height is the biggest problem of Gilas because they can't just rely on their outside shooting. Marcus Douthit had a great game. So far he's been very consistent for Gilas. Without him, I think Gilas will not be in the semi-finals. But he just can't do it alone. He needs another big man who can help him in crashing the boards. He just can't single handedly handle the other big men of their opponents. 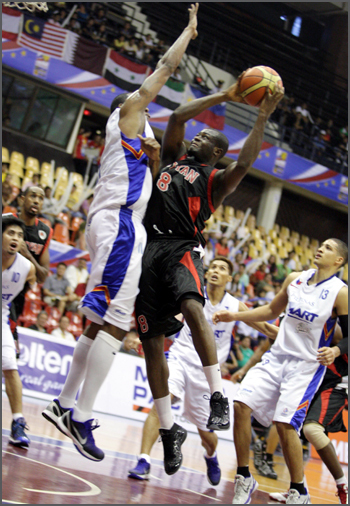 In this game, Douthit was not fully able to stop Yasseen Musa, Qatar's deadly center. He can't handle him one on one. Mussa was the reason why Qatar was able to build a more comfortable lead in the 3rd quarter. Douthit was able to score 28 big points and he added 17 rebounds in this game despite Mussa's presence. Just a testament on how dominating Qatar was in this game, they had 20 rebounds compared to Gilas' 8 rebounds. Chauncey Leslie, the fiery import of Qatar played like Chauncey Billups in this game. He showed to Tiu and Casio how to effectively score. He had 28 points in this game. His partner, Targuy Ngombo, the one who wore the number 8 jersey for Qatar added 18 points and 12 rebounds for Qatar. He also showed a steady free throw shooting despite his young age. He was able to ice the ball game in the last 30 seconds of the fourth quarter. “I take the positive that even in a bad game we showed character to fight a team like Rayyan close." Here's the complete stats of this game.